It has been the BUSIEST spring of my life with my baseball playing son finishing his senior year of high school! 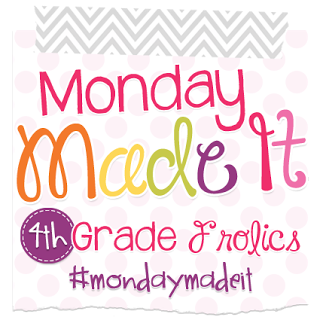 I thought I’d share a little bit of what I have been working on in June in my few spare moments so I have hooked up with Tara at 4th Grade Frolics for my first “Monday Made It” of the summer! Make sure to click the image below to take you to the link up to see all the other great ideas people are sharing this week! The main thing I have been working on this spring has been survival–surviving the end of the school year (I finished June 9), finishing the baseball season (We finished last Tuesday with a loss in the State Semifinals), finishing my son’s senior year/graduation, and FINALLY–his grad party on Saturday. I thought I’d share a few things I made to make the day as special as I could! 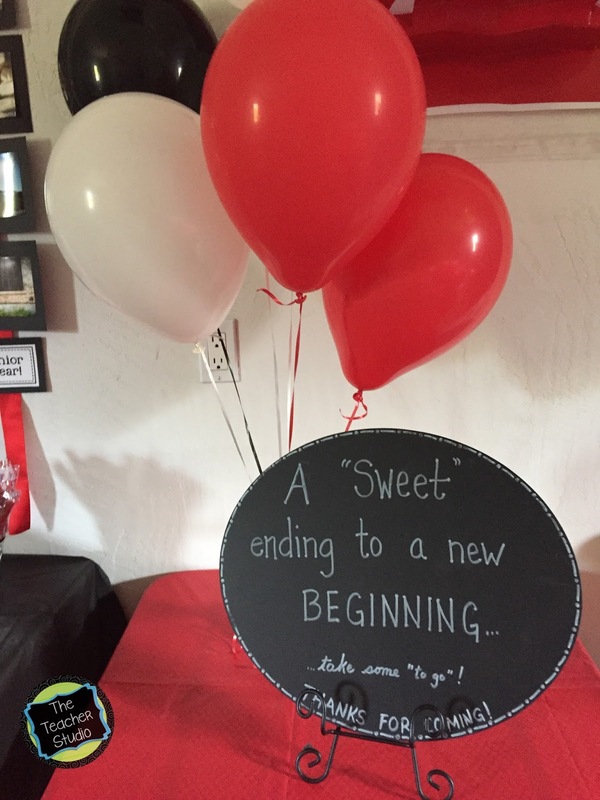 It was a great day…although certainly bittersweet. The party. 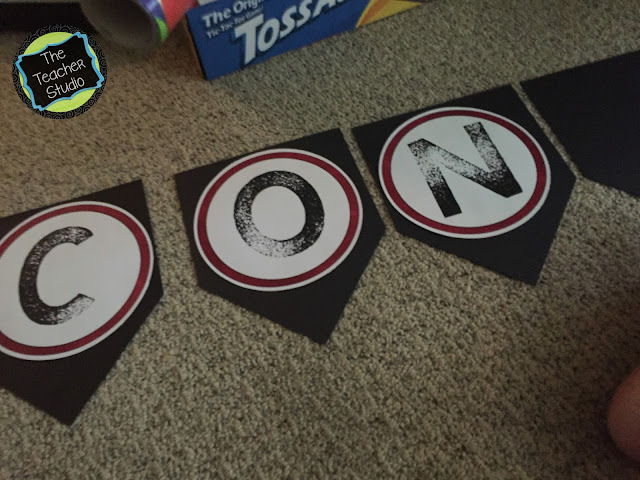 First o all, it seemed silly to spend $9 on a banner when I could make one, right? Ummmm…several hours later and probably $5 worth of ink and card stock, world’s LONGEST congratulations sign was born. I hung it on one wall of the garage with a bunch of photos…on the right I used red ribbon and strung all his school/formal pictures…from 3 months to 4K to senior pics! 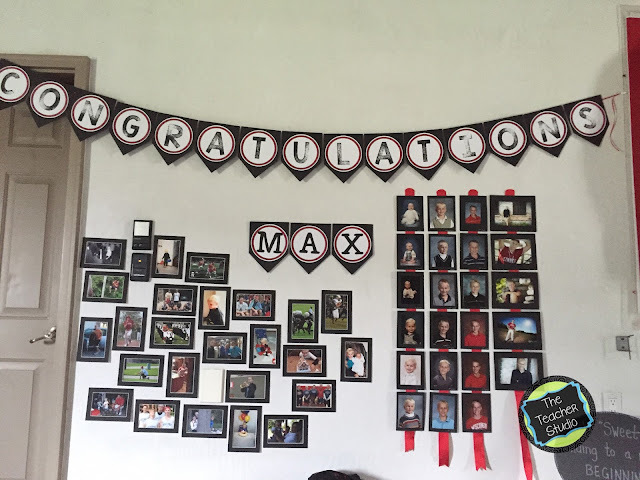 I mounted the pictures on black card stock and used a silver pen to write his age on each. Everyone loved to see how he has changed in 18 years. The other candids are some of my favorite shots from the last 18 years–many with friends. I bought some cheap black mats online and just taped the photos to the back. I had to rent tables and chairs because we have none! 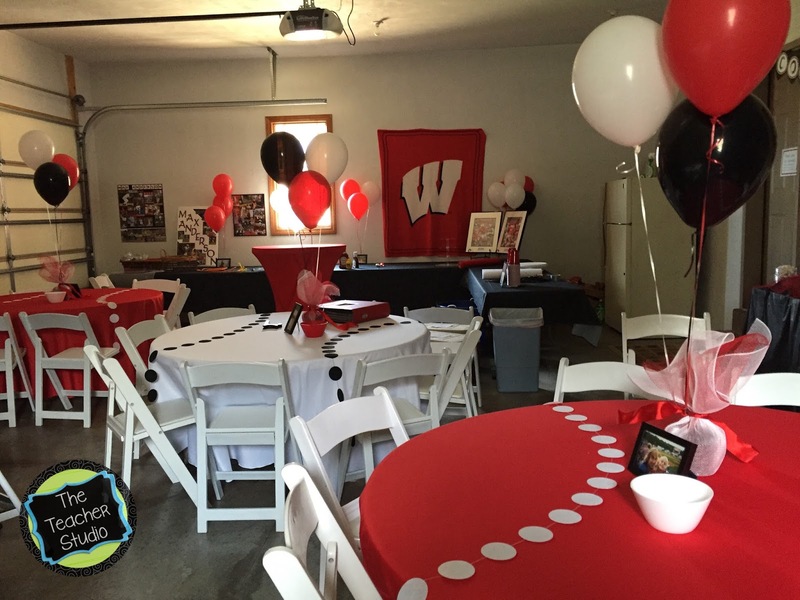 I used red and white (his high school AND college colors!) and these funky little dot garlands I found on clearance at Target to make the tables into a baseball theme. More photos on each table, of course–as well as collages on little easels everywhere. 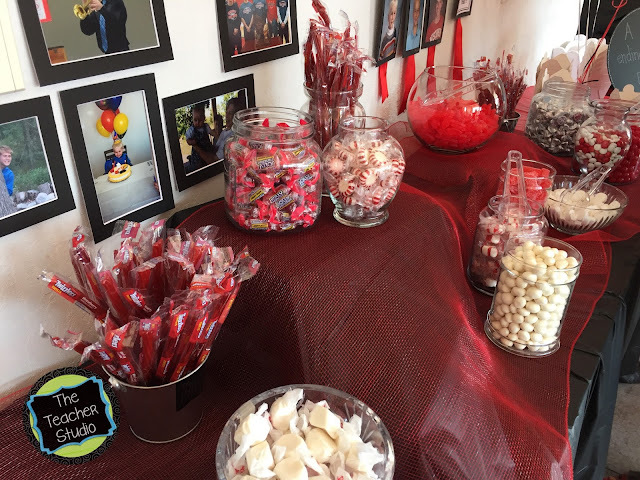 My son is a “candy guy” so I made a candy buffet for his friends…to eat during the party and then had a stack of take out containers so they could take some “to go” as well! 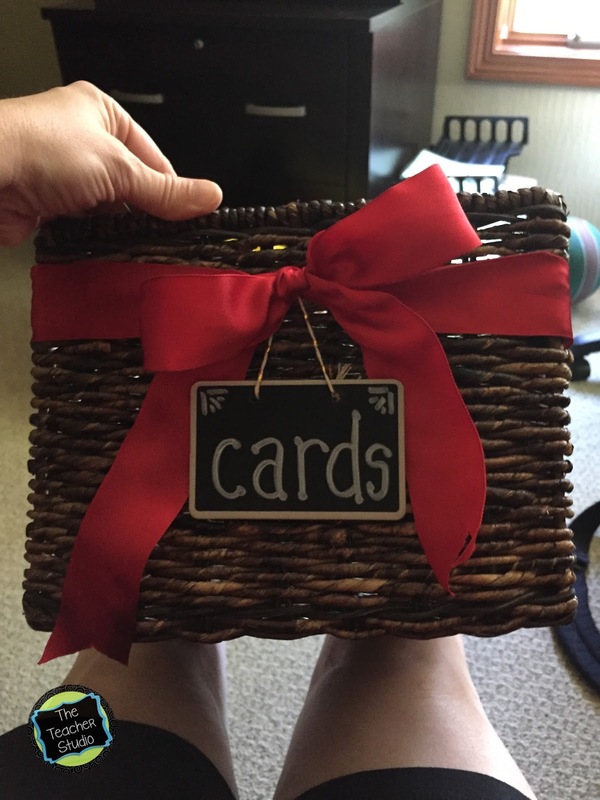 I didn’t want to buy a cardboard box for his cards so I just tied a ribbon around a basket I already had and used a little chalkboard sign I found in the Dollar Spot. I can’t tie a bow but finally convinced myself that I just had to live with it. With temperatures pushing 90 degrees and so much food that you should ALL have come, we had a great day. I am so blessed that my son had an amazing high school experience with great friends and family. It was quite a celebration. 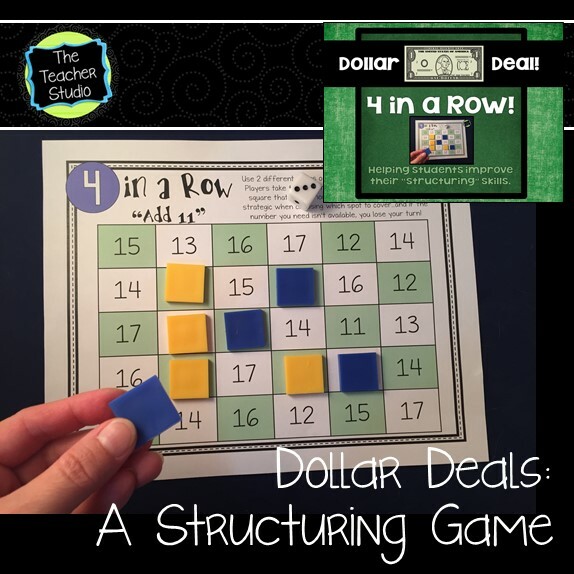 Because I’ve been so busy, I haven’t had much time for working on school things…but I am trying to get more intervention materials ready for the fall, so I did get one new game ready to roll. Tomorrow I plan to blog a little about what “structuring” is and how important it is for our students. This game is meant to help reinforce those concepts so stop back tomorrow and learn more about it! Thanks as always to Tara for hosting this fun link up…and I am excited to be back blogging a bit more regularly now! Happy summer to all of you–and for those of you not quite finished yet, the end is in sight!